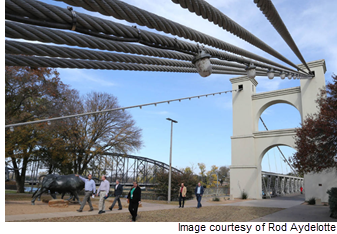 ​​ WACO – The Waco Suspension bridge will undergo partial closures this month as testing begins before a $5.5 million makeover. The project would replace the wooden decking with a waterproof surface, repair deep cracks in the bridge towers, reinforce the anchors and replace all of the steel cables. The renovation on the 148-year-old structure would begin early 2019. “It ties east and west together,” Deputy City Manager Wiley Stem said.